Is it worth tacking upwind with a Flat Earth sail? 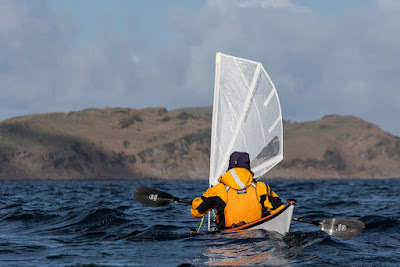 Flat Earth kayak sails will sail to about 68 degrees off the wind. This means they can definitely get to windward but is it worth tacking upwind or should you just drop the sail and paddle? To find out I did the following experiment and recorded the data on my Garmin GPS. 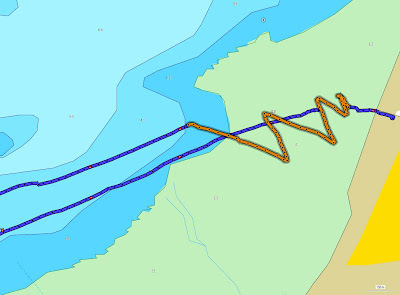 This GPS track shows tacking upwind into a 12kt WSW wind. Although I seemed to be sailing about 45 degrees off the wind, that was the effect of the apparent wind, the combination of true wind and the wind generated by boat speed. The GPS track shows that a Flat Earth sail will point about 68 degrees off the wind. This compares with about 45 degrees for a typical dinghy with a centre board. At first I tacked upwind while both paddling and sailing. I covered 1600m over the ground but only 600m upwind in 15.28mins. The over ground speed was 6.3km/hr but the upwind speed was only 2.4km. Next I dropped the sail and paddled directly upwind. I covered the next 600m in 6.72mins, which meant the upwind speed was 5.4km/hr. The conclusion is that it is not worth tacking upwind with a Flat Earth sail. However, if you can lay, or nearly lay your mark, by sailing on one tack then it is definitely worth paddle sailing upwind with the Flat Earth sail. That is exactly what we did in the top photo, we were just able to lay Gull Point at the South end of Little Cumbrae on our way from Portencross to Glencallum Bay on Bute.